These Dreamers started businesses. Will they have to leave them behind? Juan Martinez is building an artificial intelligence company. But President Trump's decision to repeal DACA could derail his plans. The 27-year-old resident of Austin, Texas is one of roughly 800,000 people who enrolled in the Deferred Action for Childhood Arrivals program, which allow undocumented immigrants brought to the U.S. as children to live and work domestically without fear of deportation. The future of the program is uncertain. Congress has only five months left to come up with a legislative fix. For Martinez, that means the future of his four-person firm is up in the air, too. "It's critical to have a good immigration status," said Martinez, whose parents brought him to Texas from Mexico when he was four. "How are you going to get funding if you don't have a Social [Security number]? In the tech space, it's a must." More than 5% of DACA recipients have started their own businesses since enrolling the program, according to a recent survey. The study was conducted by Tom Wong, a professor at the University of California, San Diego; immigration advocacy groups United We Dream and the National Immigration Law Center; and the Center for American Progress, a left-leaning think tank. They found that the number grows to 8% percent among respondents who are older than 25. Though so-called Dreamers have to renew their DACA status every two years, the designation allows recipients to get documents that provide a measure of stability, like driver's licenses, official work permits and even a Social Security card. Related: She met with a President inside the White House. Now she's protesting outside. Daniela Velez, 23, said getting her driver's license allowed her to feel like she could start to build something. "When I got my driver's license, that was it," she said. "...I could have a normal life. [Being normal] to me was not being afraid that a police officer's going to stop me because I'm behind the wheel without a driver's license." These days, she works and attends school. She also runs a small business selling take-home kits for physics labs at Rowan College, where she earned her associate's degree. The kits, which she makes in part using a 3-D printer, allow students who can't attend college lab courses take an online version at home. "It allows students to graduate on time, and it allows more flexibility," she said. 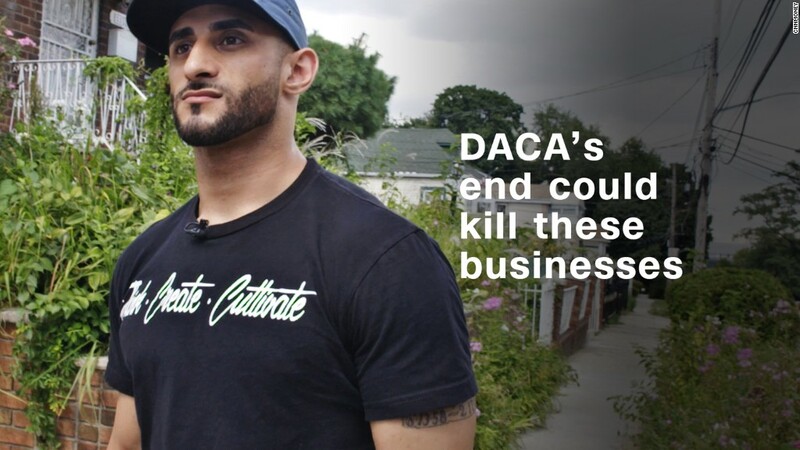 Across the Hudson River, DACA also opened doors for Mostafa Ghonim. One year ago, after working multiple hospitality jobs, the 27-year-old launched The Dream Supply, a company that helps boutique New York City hotels staff their events. He now has between 20 and 30 employees. "I [grew up] around my father and my uncle, and they've always owned their own businesses. It was the one thing I was always exposed to," said Ghonim, whose parents brought him from Egypt to Queens when he was seven. As lawmakers equivocate on DACA, Martinez, Velez and Ghonim intend to keep growing their operations. Next summer, Martinez plans to officially roll out his company, Spread Technologies. His vision is to use AI to reshape the construction business, which Martinez says is still a paper-and-pencil industry. His program will allow companies to better manage scheduling, payroll and the distribution of workers across sites. "I've worked in construction my entire life. Laying concrete, framing, landscaping. When I was in school, I remembered all the inefficiencies that I saw," Martinez said. He graduated from the University of Texas at Austin with a degree in computer science and applied mathematics in 2015. His DACA permit is set to expire in December. But Trump gave Dreamers whose DACA permits lapse before March 5, 2018 one month to apply for renewal, and that deadline is midnight on Thursday. U.S. Citizenship and Immigration Services says it's received 118,000 applications for renewal, out of 154,000 people who are eligible. Martinez has already sent in his application -- and if it's approved, it will stay valid for two more years. He'll reassess things then, he said. Ghonim's current DACA authorization is valid until November. He's also sent in the paperwork for his two-year renewal. "We're not looking for a handout. We're not looking for any shortcuts. We just want equal opportunity," Ghonim said. Velez said her DACA permit expires in November 2019. But her 19-year-old sister's permit expires on March 6, which means she misses the Trump administration's deadline to reapply by a single day. Once that date passes, her sister won't be able to work, and she could be apprehended by Immigration and Customs Enforcement agents at any time. They're currently evaluating their options with their family. But returning to Venezuela is hardly an option. The country is in the midst of a political crisis as President Nicolas Maduro moves to consolidate power and silence his opponents. The economy is also spiraling, as inflation exacerbates shortages of food and medicine. "Going back to Venezuela means fighting for my life," Velez said.